Thru-hiking the Appalachian Trail is one of the most adventurous things you can do in the U.S. 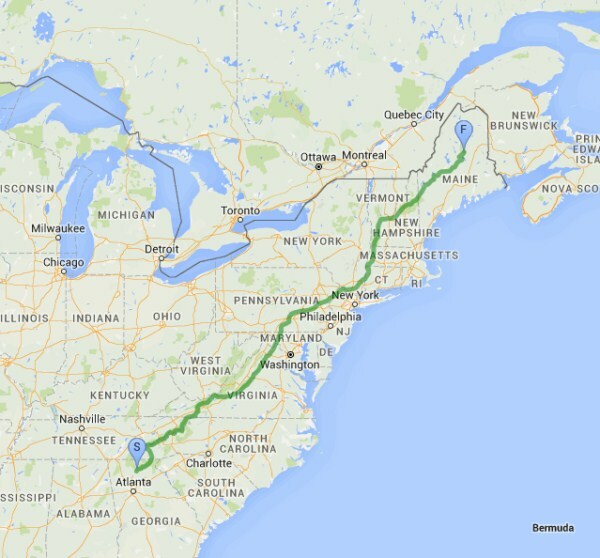 It is an arduous but rewarding journey that will lead you across 14 different states. The trail spreads between Mount Katahdin, Maine and Springer Mountain, Georgia. Usually, it takes people around 6 months to finish it. The Appalachian Trail will test you both mentally and physically. Also, you can encounter various difficulties and dangers while on it. This is why you have to prepare properly in advance and get all the necessary information ahead. This article will answer all the questions you might have! 1 How popular is hiking on the Appalachian Trail? 2 How long is the Appalachian Trail? 3 How long does it take to hike the Appalachian Trail? 5 How much does it cost to hike the Appalachian Trail? 6 What do you need to carry? 7 Do I need to register and how to avoid the crowds along the Appalachian Trail? 8 What do I have to know about shelters and accommodation? 9 How to prepare physically for the Appalachian Trail? 11 Are there dangerous animals on the Appalachian Trail? 12 What type of environmental issues can I expect on the Appalachian Trail? How popular is hiking on the Appalachian Trail? When it comes to overall popularity, the Appalachian Trail is probably one of the most famous and most popular hiking trails in the world. Trails of Mount Everest, Machu Picchu and Kilimanjaro are the only ones that can compare in that sense. However, it is also among the hardest for thru-hiking. Together with the Pacific Crest Trail, it is considered the longest hiking path in North America. 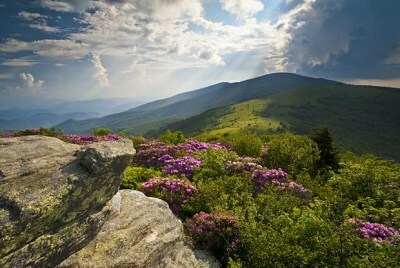 People all over the world come to see the Smoky Mountains and spend a few days walking and admiring its beauty. Under the National Trails System Act of 1968, the Appalachian Trail is referred to as a National Scenic Trail. In other words, it is a trail of great natural beauty as well as a protected area. In fact, this trail and the Pacific Crest Trail were the first two trails to receive this title in 1968. Every year, approximately 2 million people take their time to hike on the Appalachian Trail for at least one day. However, the number of hikers that actually finish the entire trail is about 2,700. This says a lot about the difficulty of the trail and how hard it is to cross these mountains. Altogether, the Appalachian Trail is about 2,200 miles (or 3,500 kilometers). As previously mentioned, it passes through 14 states: Maine, New Hampshire, Vermont, Massachusetts, Connecticut, New York, New Jersey, Pennsylvania, Maryland, West Virginia, Virginia, Tennessee, North Carolina, Georgia. It basically goes through entire East Coast. Like other hikes, it will mostly take you through mountainous terrain. Hikers will basically cross over the Great Smoky Mountains. However, you won’t have to deal with extreme heights. The highest peak of the Smoky Mountains is Clingmans Dome (6,643 feet or 2,025 meters) while the lowest is Bear Mountain State Park (124 feet or 38 meters). Due to the terrain, the entire path will feel much longer than it actually is. The Appalachian Trail (or the A.T.) is one of the longest footpaths in the world. That being said, it is not surprising that hikers take from 5 to 7 months to cross it. Most people start with 5 to 10 miles per day. However, on average, people cross 10 to 15 miles every day. Have in mind that this is an average statistic including both people that hike for a day or two as well as those who cross the entire path. But, the variations are enormous. For example, some people finish this distance in one year. On the other hand, the record is just 46 days. Nevertheless, if you intend to finish the entire trail, you will have to have good pacing. The thing that many people do not realize is that crossing the Smoky Mountains is not a question of strength (or even endurance) but how you utilize your energy and replenish your strength. In that regard, proper nutrition and preparation do much more for you than conditioning (even though conditioning is still very important). Another thing that needs to be considered is your starting point. The mountainous regions of Maine are much colder than Georgia. In early spring, Maine will still be covered in snow and ice. If Maine is your starting point, May is the best time to hike the Appalachian Trail. On the other hand, those who begin from Georgia should plan ahead so they arrive in Maine around summer. This is how the A.T. looks in general. Height zones do change but this is the overall layout. You can see a lot of trees up to Mount Moosilauke where topography becomes barren and rocky with evergreen species being dominant. Parts of Pennsylvania are also very rocky and can be troublesome for hikers. Maine can be very harsh, with a lot of snow and ice. Furthermore, Mount Katahdin is the second biggest alpine environment in the U.S. When it comes to temperatures, they can vary substantially. No matter what, as you start hiking towards north, it will slowly become colder. Spring and fall temperatures can be rather low and you may even encounter snow on higher altitudes. In these regions, temperatures below zero are quite common. However, the summer can be really hot and you will most likely need sunscreen, and sunglasses to protect your eyes. How much does it cost to hike the Appalachian Trail? Before anything else, you need to calculate the costs. This is especially important for thru-hikers as it may take them several months or up to a year to walk the entire distance. Have in mind that you can save a lot based on your preferences. In other words, people who do not wish to visit hotels and instead sleep in their tent can cut the costs significantly. This is especially common for fast thru-hikers who do not wish to stay in towns for too long. But, you should never skimp on food. Hikers burn a lot of calories during the day and it is necessary to replenish them so that you could carry on. It is very hard to give you an exact price but the average cost of hiking the Appalachian Trail is between 1,000 and 2,000 dollars per month. Then again, there are people who can do it in less than a thousand and those who make a spectacle out of it, spending more than 3,000 dollars per month. One of the biggest initial costs comes in the form of equipment. If this is your first time hiking, you will need to get everything. As for the transportation, you will have to pay the costs to and from the A.T. People who live in the United States can do this for a couple hundred dollars while visitors from Europe and other parts of the world will have to spend more than a thousand. On top of it all, there are several fees that need to be paid. First, you will have to get a permit for thru-hiking along the Appalachian Trail which costs $20 (as of this writing). Besides that, you may expect some overnight stay fees, especially in New England and Maine. What do you need to carry? We mentioned the basic costs. But, we still need to mention what you need to buy for that money. When you’re ready for a full rundown of the gear to bring, check out our Appalachian Trail gear list. On top of that, you should get food for several days (from 5 to 7 days) as well as water for 3 days. As you can presume, you will have to replenish supplies in towns. More experienced hikers use mail drops. With them, you can send supplies and food to towns that are on the trail. When a hiker passes through them, he can simply pick them up instead of shopping in nearby stores. The load can vary from 20 lbs (9 kilograms) to 35 lbs (16 kilograms). Even though this seems like a lot, these are the basic provisions that will ensure that you arrive at your destination safely. Do I need to register and how to avoid the crowds along the Appalachian Trail? For the time being, there is no formal need to register. However, the Appalachian Trail Conservancy (ATC) does encourage it as a way to track hikers and their movement. This is especially important as it helps reduce overcrowding. The entire region is one big national park and in recent years, there has been a lot of damage to wildlife. As a way to prevent this, hikers should pick a date when there are not as many people on the Trail. Most people tend to start from Springer Mountain, Georgia northbound (otherwise known as NOBO while southbound is SOBO). According to the data provided by Appalachian Trail Conservancy, the period between March 1 and April 1 is especially critical. These options are great for people who do not wish to thru-hike the entire trail at once and prefer to avoid the crowds. Have in mind that you will have to make breaks between destinations. For more information, visit this page. What do I have to know about shelters and accommodation? There are two main options you should consider: sleeping in towns and sleeping in the wild. Of course, given that you cannot really choose hotels during hiking, you will have to make do with what you have. Nevertheless, your main concern is a warm bed and full stomach and everything else should come later. Those who prefer sleeping outside have two options: tents and shelters. There are pros and cons to both options. Anyway, it is best to mix them. There are more than 250 shelters along the A.T. They are pretty large (8 x 12 feet) and up to 20 people can fit in them. Shelters are a great place to hang your clothes, to socialize, get the latest news and also, to get some food from short distance hikers that brought too much weight. The main issue with shelters is that they are unpredictable. Although there is a lot of room in them, they might be full. Having in mind there is a shelter on every 5 to 10 miles, it may be too exhausting for you to walk to the next one. Nevertheless, they are a really nice option as there is usually a water source nearby and they are good for socialization. 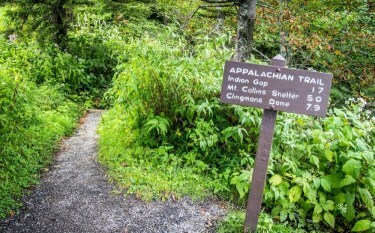 Related: What Are Appalachian Trail Shelters Like? No matter what, you will have to rely on your tent. If there are black clouds looming over your head, you can quickly set up a tent and hide inside. Also, they give you some solitude and allow you to camp off the track. But, setting up a tent does require some time and strength. If you are tired, this can pose a problem. This is why you have to switch between tent and shelters. In the end, it all comes down to personal preferences. How to prepare physically for the Appalachian Trail? Depending on the distance you wish to cross, your conditioning will be more or less important. You have to make sure you are fit enough to walk for at least 10 miles in mountainous terrain. People, who wish to hike a shorter distance for a day or two quickly realize that it can be rather strenuous. If you wish to hike for several days or weeks, you will have to improve your core strength. Bear in mind, we are not referring to weight lifting. A hiker should have a lot of stamina and should do a lot of aerobic training. Push-ups, sit-ups and squats are all good. Leg conditioning exercises are a must. However, no matter how many hours you spend riding a bike or running, nothing can prepare you for the real deal. Always remember that you have to carry a big backpack during the hike so this will test your resolve even further. Your feet are a special case. Not only do you need to improve their fitness level, you will also have to think about your ankles and skin. Excess weight and physical strain simply crush your ankles. Use a balance board to strengthen them. Skin can also be a problem. Open wounds might appear if you are not careful. By using a mixture that will strengthen your skin, you will be able to hike with less trouble. Nevertheless, you will require a med kit as a precaution. If you’re new to backpacking in general, see our beginners backpacking guide. No matter how fit you are, it is impossible to hike on an empty stomach. Improper diet can make or break your dream of thru-hiking the Appalachian Trail. As said, it is necessary to have food for at least several days. In certain areas, you can easily resupply so this can reduce your load for a little while. Nevertheless, if you do not have enough knowledge regarding the layout of the towns, it is better to constantly have spare food for at least 4 days. The average man burns around 5,500 calories per day (3,500 for women). This is an enormous amount of energy that needs to be replenished. Basically, you will be food deprived during the entire hike. At the same time, this will allow you to eat almost anything. Focus on protein and fat rich food. You will need strong meals. Otherwise, you will start losing muscle mass. Dry food is a great solution. Make sure that everything is easy to prepare. Finally, you will need increased amount of salts to prevent cramps. Water is extremely important during the hike. Make sure to drink all the time and have a bottle ready. Electrolyte drinks are also crucial. There are a lot of springs along the trail. Most of them are near shelters. But, not all of them have drinkable water. This is why you have to make reserves for a day or two in case you can’t get fresh water near a shelter. Anyway, whenever you get it from a natural source, make sure to treat it. Filters are a great solution here. Are there dangerous animals on the Appalachian Trail? Generally speaking, there is no real danger of an animal attacking you. Surely, there have been a lot of sightings of bears and snakes. When it comes to bears, they are usually timid and will not approach you unless you do something aggressive or endanger the cubs. They might smell your food and come to your camp as they have become used to the human presence due to increased activity in the area. You should hang your food on trees so they can’t reach it. Also, do not cook near the tent as the smell will remain in the air. Snakes and spiders are a different story. 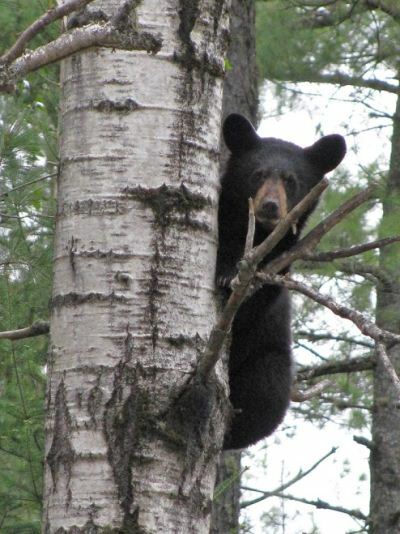 Unlike bears, they are hard to spot and you might even step on one of them while walking. Luckily, most of the species on the A.T. are not venomous. However, if you encounter venomous copperheads and timber rattlers, you may be in danger. Make sure to check your clothes before putting them on as spiders and snakes may crawl in them during the night. When it comes to insects, ticks and mosquitoes are the biggest issue here. While mosquitoes are really annoying, ticks are the ones that represent a health hazard. They can give you lime disease so you will have to perform checks every day. As for mosquitoes, a repellent will be enough. If you need more info regarding flora and fauna, as well as how to prevent accidents and treat wounds, check this page. Related: Interested In Hiking The Appalachian Trail With A Dog? What type of environmental issues can I expect on the Appalachian Trail? Those who decide to thru-hike the entire Appalachian Trail will have numerous considerations regarding the weather. It becomes even harder to predict things given how many months it takes for you to reach the other side. Even with good preparation, you never know what to expect. Obviously, there are numerous things you have to consider before you are on your path. When it comes to bad weather, you shouldn’t consider it; you should count on it! Early spring and late autumn can be really perilous. Even if you are in southern parts, you can still expect snow. This shouldn’t be particularly surprising given that you are in the mountains most of the time. On the other hand, in northern states (mainly Maine and New Hampshire) you can even expect snow in June. If you need more precise data regarding the temperature, visit the National Park Service website. Keeping track with the current weather can also help you with the next potential problem – heat. Virginia and West Virginia are notorious for their low humidity during summer which can interfere with perspiration. As a result, hikers can expect cramps, burns, heat exhaustion and heat strokes. This is why you should always try to hike in early morning and before sunset. Avoid too much exposure during midday and try to find proper shelter when resting. Hypothermia is directly caused by cold rain, strong wind and lack of proper clothing. It can be especially disastrous for thru-hikers as they approach their goal. After a while, their energy reserves will be depleted and they won’t be able to make up for the loss of body temperature. As a protective measure, make sure to stay hydrated, well fed and rested, to take cover as soon as you notice cold rain and to wear synthetic and wool clothing. Waterproof boots should be considered as well. River crossing is something that most hikers do not consider as a hazard until they fall into water. This can be especially treacherous during and after cold days, when the ground is slippery due to ice, snow and rain. You can easily fall down into a river which can result in hypothermia and other cold related illnesses. If the terrain seems problematic, try to find an alternative, safer crossing. Lightning is not as dangerous as the other natural threats but there is still a chance to get struck. Finding a shelter is the best way to prevent any accidents. Avoid tall trees, solitary rocks, open terrain on high altitude and tall, metal structures and objects. Even though may not actually face a life or death situation, it’s prudent to possess at least basic outdoor survival skills. You will never be lonely – There are a lot of hikers on the A.T. especially in the southern parts, during early spring. Break your boots in – Don’t tackle the AT in brand new boots. Most boots take some time to mold to the unique shape of your feet, which makes them much more comfortable. The more comfortable your footwear, the more likely you are to push on. If you have wide feet, get hiking boots made specifically for wide feet. Be grateful and considerate – Make sure to be polite and work with others to conquer the mountains. You do not need a map – Areas are well marked so it is hard to get lost as long as you are following the Trail. However, it is good to carry a map in a case of emergency. Campfires are not permitted on some parts of the Trail – Many areas along the A.T. restrict fires to designated sites only or prohibit fires altogether. Here is a chart listing regulations for fires and camping. Learn safe ways to build a fire here. Reduce weight whenever you can – It is one of the main things that can contribute to your success. Check out these Ultralight backpacking tips. Pace yourself – You shouldn’t be too hasty. There is a long way ahead of you and you need to go day by day. Lace Tying – Learn the various ways of tying your boots. This seemingly small thing can make a huge difference in your daily comfort. Do not think too much – If you start thinking about all the miles that are ahead of you, it will be much harder. Hiking is also a mental game. Take rest days – Unless you are into a fast thru-hike, make stops in towns and rest properly. You will have a lot of injuries, blisters and fatigue over the course of the hike and you will need to treat your body properly. Keep at least some level of hygiene – Even though this sounds impossible, you will have to keep your cleanliness in check. Make sure to filter your water and utensils to prevent any diseases. Dispose of your food properly so that you don’t attract wild animals to shelters. Medical care – Treat your wounds as soon as they appear. Use lubricants or sprays to prevent and treat chafing. Ventilate your feet to prevent blisters. I hope this guide helped you and that you will have an incredible time on the Appalachian Trail!